Courtesy St. Kitts Tourism Authority: Chairman of the St. Kitts Tourism Authority, Nick Menon, Achievement of Excellence Award, Caribelle Batik, CEO of the St. Kitts Tourism Authority, Raquel Brown. 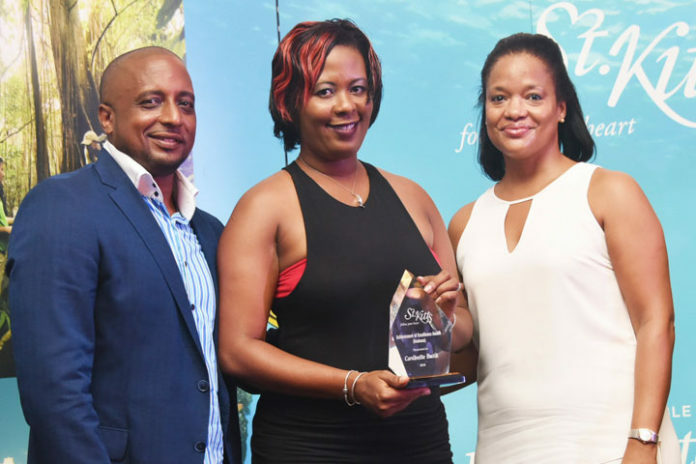 Basseterre, St. Kitts, May 24, 2016 (SKNIS): The 2016 St. Kitts Tourism Experience Awards, held under the theme “Celebrating Excellence Changing Lives,” recognised a number of individuals and businesses, who represent the very best in the tourism industry. At the May 21 event, held at Carambola Beach Club, Minister of Tourism, Honourable Lindsay Grant, said that the over achievers have often gone above and beyond the call of duty according to their job descriptions to ensure that St. Kitts is providing only the best experience possible to visitors and simultaneously to residents. “I cannot stress enough how important it is that we continually strive for excellence in this business as it is the memory of the experience that we provide that will ensure that people will keep returning to those restaurants, to those hotels, to the shops, the activities providers and in fact in our island overall,” said the minister. The tourism minister said that in the travel and hospitality market place today, research overwhelmingly indicates that consumers are placing greater importance on experiences. Visitors want to understand what it is about a destination that makes it special and unique. The minister said that St. Kitts and Nevis are blessed with an “unspoilt lush natural landscape, a rich heritage and a time honoured tradition and most important of all, we have the most welcoming, genuinely friendly people.” He added that this however is not enough. “We must continually and consistently strive for excellence to improve upon the experiences that we provide as competitive destinations around the world are striving to do the very same thing that we are striving to achieve,” said Minister Grant.